Baladas Demnevanni is a Dunmer sorcerer living in the Velothi tower of Arvs-Drelen, which is located in Gnisis. He is a Wizard of House Telvanni but is not a member of the council until you complete the associated quest. If he becomes a councilor, you will have to persuade him to vote for you as Telvanni Hortator. Baladas is reclusive and generally does not concern himself with the people of Gnisis. He is not quite as arrogant or isolationist as many of the other Councilors and pursues an interest in the Dwemer. 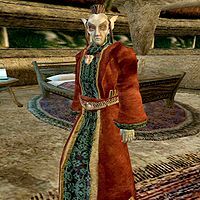 People around Gnisis may mention Baladas, calling him a "renegade Telvanni wizard". He is wearing an expensive robe with matching shoes, a leveled ring, and a leveled amulet. He is carrying a leveled potion, a leveled soul gem, four leveled enchanted items, a key to a cell in his tower, and 300 drakes. Aside from his natural resistance to fire and the sanctuary provided by his ancestors, he knows the following spells: Burden of Sin, Dire Weary, Great Feather, Command Beast, Command Creature, Strong Reflect, Strong Spelldrinker, Wild Spelldrinker, Summon Storm Atronach, and Summon Flame Atronach. He is accompanied by a Dwemer Shock Centurion he has restored. It will not be hostile to you unless Demnevanni himself is. This animunculus will be given to a Telvanni player upon completion of the Dahrk Mezalf quest. Dwemer Books: Find three rare books for Baladas in Gnisis. Dahrk Mezalf: Recover an ancient Dwemer ring from the ruins of Bthungthumz. Three Questions for Baladas Demnevanni: Question this scholar in Gnisis on three pivotal questions on the Dwemer. Baladas Demnevanni: Convince Baladas in Gnisis to join the Council. Rescue Ragash gra-Shuzgub: Find out what happened to the town's tax collector. Mystery of the Dwarves: Discover what really happened to the Dwemer. Telvanni Hortator: Persuade House Telvanni that you are their Hortator. Writ for Baladas Demnevanni: Execute this powerful spellcaster in Gnisis. Master Index: Collect each of the ten Propylon Indices. "I am Baladas Demnevanni. And this, Arvs Drelen is my home. Why have you come here?" "What brings you here, %PCName?" chores: "I may have need of you later, but for now you should study and practice so that you may advance further in House Telvanni." Darius: "He plays his role in town, and best keep his hands out of my business." [Disposition < 70.] "It is said that the Dwemer refused to discuss research with those who demonstrated neither interest nor competence in the subject." [Disposition ≥ 70.] "It was unfashionable among the Dwemer to view their spirits as synthetic constructs three, four, or forty creational gradients below the divine. During the Dawn Era they researched the death of the Earth Bones, what we call now the laws of nature, dissecting the process of the sacred willing itself into the profane. I believe their mechanists and tonal architects discovered systematic regression techniques to perform the reverse -- that is, to create the sacred from the deaths of the profane. As the Dwemer left no corpses or traces of conflict behind, I believe that generations of ritualistic 'anti-creations' resulted in their immediate, but foreseen removal from the Mundus. They retreated behind math, behind color, behind the active principle itself. That the Dwemer vanished during a conflict with Nerevar and the Tribunal is merely coincidence." [Disposition ≥ 60.] "This is an explanation of how the Dwemer tried to make a new god, Anumidium, using Kagrenac's tools and the sacred tones on Lorkhan's Heart. It has several interesting theories about how to bend the Ehlnofey or "Earth Bones," but I am not entirely sure I understand it myself. Perhaps after another century of study I could have a better answer for you." [Disposition ≥ 60. If you have Divine Metaphysics, Hanging Gardens, and the Egg of Time in your possession.] "Yes, I can now translate these books. This first one is Bthuand Mzahnch's refutation of a popular theory from Nerevar's time. A few tones of Dwemer believed that using the power Lorkhan's Heart was an unjustifiable risk. "The Egg of Time" contains Bthuand's arguments against this idea, many of which are quite compelling. The next book, "Divine Metaphysics," is an explanation of how the Dwemer tried to make a new god, Anumidium, using Kagrenac's tools and the sacred tones on Lorkhan's heart. [Disposition < 70.] "If you seek the artifacts of the Dwemer, visit one of the Dwemer ruins. [Disposition ≥ 70.] "In their denial of both phenomena and noumena, the Dwemer found comfort in the creation of Animunculi, which in their operation, combined two incompatible principles, thus denying both. In the first Dwemer ruin I studied, quite by chance in my wandering youth, someone had activated the Animunculi guardians and I was unable to make a proper study of them. Since then, I have, on occasion, found ruins, especially here in Vvardenfell, where the Animunculi are still active." [Disposition < 80.] "I do not know the Dwemer language." [Disposition ≥ 80.] "The Dwemer language is unknown, perhaps unknowable. Some Dwemer books, especially records dating from after the founding of Resdayn, were written in Aldmeris, making them accessible to modern scholars. However, even in Aldmeris, many Dwemer terms remain uncertain. As the books and other artifacts in Dwemer ruins rarely show signs of wear or age, I believe that the Dwemer knew of a preservative effect, perhaps a device still active which denies or controls the Earth Bones governing time and decay. [Disposition < 80.] "There are many scattered across Vvardenfell. There is one on the coast northwest of here." [Disposition ≥ 80.] "You seem to truly have an interest in the Dwarves, so I will tell you this. Sneak into the Gnisis Eggmine. I heard they made a most unusual discovery recently." [Disposition ≥ 60.] "This is Bthuand Mzahnch's refutation of a popular theory from Nerevar's time. A few tones of Dwemer believed that using the power Lorkhan's Heart involved unjustifiable risks. "The Egg of Time" summarized many of Bthuand's arguments against this idea, many of which are quite compelling." Gnisis: "Everyone here leaves me alone. That's how I like it." [Disposition ≥ 60] "So you have found a book. Let me see... Yes, this is written in both Dwemer and Aldmeris. I would keep this book somewhere safe. Perhaps you will find other books in the Dwemer language, and could use this book to translate them. If you find anything of interest, bring both the books to me." "I have little interest in the affairs of House Telvanni... But it would not be an inconvenience to me. I will agree to join the Council on the condition that you do three chores for me." "You have brought me the books that I desired, and so I will consider young Aryon's offer. I will join the Council, at least for the next century or two, and sponsor a Mouth to send to Sadrith Mora." "Yes, I will join the council. Tell Aryon to expect me to take a more active role in House Telvanni." patron: "It would not be proper of me to be your patron. But I am pleased that you would ask." "It is a historical term, referring to a special office of war leader conferred upon a general or hero in time of war. Why?" Ask how a Hortator is chosen. "All the standing Telvanni councilors vote to choose a Hortator. The vote must be unanimous. A Hortator's duty is to lead a Great House in war, so the candidate should either be a skilled and inspiring leader, or a wizard or hero who excels in single combat." Tell your story and ask to be confirmed as Hortator. [Disposition < 40.] "I'm afraid I'll have to decline. No, I believe your story. And there's no question about the proof you offer. But I feel that lately you have treated me disrespectfully, and I find it offensive. Perhaps we do need a Hortator. But perhaps we do not need someone like you to be that Hortator." [Disposition ≥ 40.] "Yes, of course. Your story is quite compelling. And there's no question about the proof you offer. I have found you, on the whole, an agreeable colleague, and I think you are a most suitable candidate for Hortator of House Telvanni." "I have chosen you as Hortator of House Telvanni." three questions: "I have already answered your three questions." There is an unfinished quest involving finally getting Demnevanni to pay his taxes that didn't make it into the final game. Glitch: If you have any follower NPC in tow, it is best to leave them outside. Demnevanni has a docile but active Dwemer Shock Centurion in his bedroom/lab, and its animation cycle may trigger a fight response from your follower, which then triggers one from Demnevanni. He is a crucial NPC to various quests, and should not be killed (at least not until quite late in the game). If this fight has already started, he and anyone else can be temporarily pacified with Calm spells. If fighting resumes after such a spell has been cast on everyone, leave with your follower while it is active, and try again (alone). If combat still re-starts, leave Arvs Drelen for 72 game hours then return. If still not working, you likely have a faction reaction issue, e.g. between Telvanni and Mages Guild (do you have a high rank in the latter? ), or a dreadful reputation among the Telvanni for some other reason (killed any of their other councilors lately?). A tip-off that this is the problem is if Demnevanni attacked on sight rather than in response to your NPC unsheathing when the Shock Centurion moved. This page was last modified on 23 February 2019, at 20:55.